MAX® USA Made Rebar Tier Wire On Airmatic Inc. It's no secret that our MAX Rebar Tiers not only significantly reduce hand, wrist, and forearm injuries, but also significantly speed up rebar connecting at any job site. 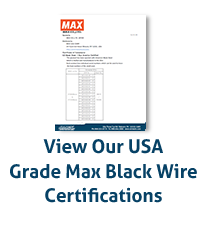 Now, with MAX USA Grade Wire, MAX Tiers can be used on any DOT job in the nation. 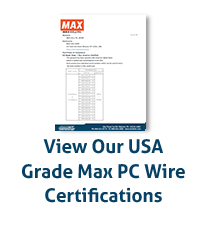 MAX USA Grade Wire has been spooled with American Made Steel - melted and manufactured in the USA. To meet "Made In The USA" and QA Standards, each product has individual serial numbers which can be traced to the heat number of the steel mill. The Mill Certified Wire is available both Black and Plastic Coated Spools. The spools use 21 Ga wire, and can be used in the RB218, RB398, and the RB518 rebar tiers. With Max Tiers making connections in less than a second, there is no quicker alternative to hand tying on the market - and it's now MADE IN AMERICA.